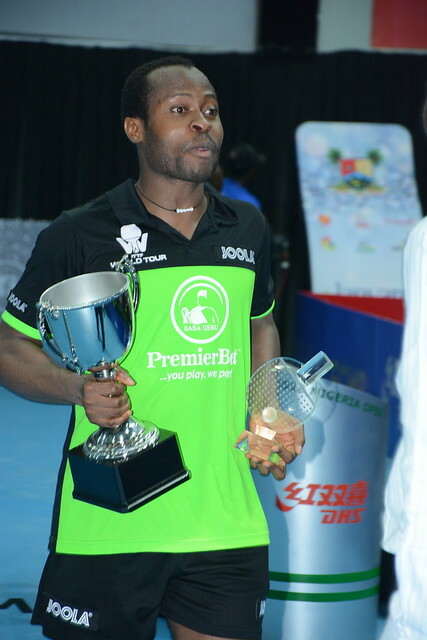 Spurred forward by a delirious crowd, the host nation’s Quadri Aruna rewarded his passionate supporters by emerging successful at the semi-final in the Men’s Singles final at the 2018 ITTF Challenge Seamaster Nigeria Open in Lagos. On the morning of Sunday 12th August; the top seed, he beat Thailand’s Supanut Wisutmaythangkoon, the no.10 seed, in four straight games (11-4, 11-9, 14-12, 11-4). Soon after, he was followed by Frenchman, Antoine Hachard, the no.16 seed, he accounted for Scotland’s Gavin Rumgay in a similar manner (11-8, 11-6, 11-4, 11-7). The faithful on their feet, responding to every move made by Quadri Aruna, their hero captured the opening two games in a contest of power versus speed. Supanut Wisutmaythangkoon was the faster player and the quicker to attack, his policy being to create angles and nullify the powerful forehand of Quadri Aruna; the response from the Nigerian was to serve from the backhand from the centre of the table to cover the wide returns. Determined and saving game points in the second, Quadri Aruna established a two games to nil lead; in the third he went ahead 7-5; Supanut Wisutmaythangkoon called “Time Out”. It was to prove to no immediate avail, Quadri Aruna won the next three points; Supanut Wisutmaythangkoon responded to reduce the difference to one point at 10-9. Quadri Aruna elected for “Time Out”, the pause worked, the crowd went delirious. Now the momentum was with Quadri Aruna; in the fourth game at 10-7 he held three match points; the first was saved, not the second, the crowd danced for joy. Success for Quadri Aruna was followed by success for Antoine Hachard; the 24 year old Frenchman proved the safer player; since junior days Gavin Rumgay has been known for his wide range of services but as matters progressed, in his enthusiasm, he made errors. In the third game, Gavin Rumgay delighted the crowd by switching to his left hand to execute a forehand top spin but it was not reap a reward. Three games to nil in arrears, in the fourth the Scot established a 7-3 lead, there was a glimmer of hope; the ray of light was soon extinguished, Antoine Hachard won the next eight points, a place in the final was reserved.